← Could The Eclipse Be A Warning Sign? Stocks fell slightly Friday, S&P 500 Index -0.18%, Dow -0.35%, Nasdaq, Russell 2000 marginally lower. Stability after Thursday’s selloff was encouraging. Market focused on Steve Bannon, other potential White House departures with little consequence. Utilities led, though Treasuries little changed; energy, materials the only other gainers. Crude oil jumped 3% on dip in U.S. weekly rig count, Venezuela tensions. Second straight weekly loss for major averages: Dow -0.84%, S&P 500 -0.65%, Nasdaq -0.64%. Biggest two-week loss for S&P 500 since November 2016 election. Focus on potential policy implications for Administration from Charlottesville incident. Stock lower early. Geopolitics (North Korea in particular), White House remain in focus. With earnings season behind us, it feels like an August Monday. Slight downside bias in Europe. Brexit talks, mergers in focus. German, French markets slightly lower, U.K. unchanged. Asian markets mixed; Nikkei -0.40%, Hang Seng +0.4%, Shanghai Composite +0.6%. Treasuries firm: 10-year yield at 2.18%. Commodities: WTI crude oil ($48.24/bbl.) -0.7%, COMEX gold ($1295/oz.) +0.2%. 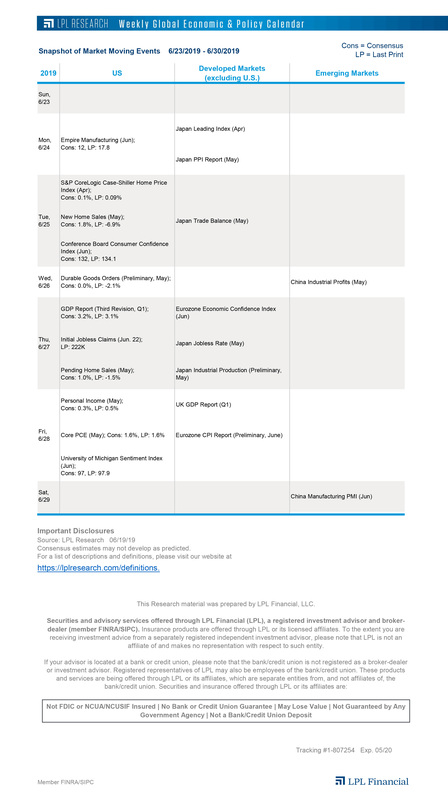 Jackson Hole likely market’s primary focus this week, but economic calendar also includes durable goods, new home sales, preliminary global manufacturing survey data, second quarter gross domestic product for Germany, U.K., Mexico. The Federal Reserve’s (Fed) annual Jackson Hole Symposium begins later this week, taking place from August 24-26. This gathering of central bankers has taken place annually since 1978 and tends to be closely watched by markets. While maybe not as exciting as today’s eclipse, this meeting has been significant historically, with central banks at times using the conference to signal upcoming changes to policy. Both Fed Chair Yellen and European Central Bank President Mario Draghi will be in attendance, though expectations for major monetary policy announcements are lower following the release of dovish July meeting minutes from both banks. We discuss our expectations for this year’s event in more detail in this week’s Weekly Economic Commentary, due out later today. Earnings season update: That’s a wrap. Second quarter earnings season is over, and it was a good one, as we detailed in last week’s Weekly Market Commentary. The S&P 500 has produced a solid 12% year-over-year growth rate, with 4% upside to estimates as of quarter end (June 30), and very impressive beat rates on earnings (73%) and revenue (69%). Energy, financials, and technology shared the load in making the biggest contributions to earnings growth. Note: This will be our last earnings dashboard of this season; however, our “corporate beige book” commentary that analyzes earnings conference call transcripts is coming soon. Generally upbeat corporate management teams. During reporting season, forward estimates only slipped 0.7%; better than the historical average drop of 2-3% and indicative of corporate optimism (analysts are almost always too optimistic). Estimates could certainly come down further, but even in the absence of a fiscal policy boost (unlikely until 2018), the earnings outlook for the second half of the year looks positive. Down two in a row. The S&P 500 closed down 0.6% last week for the second consecutive weekly drop and third in the past four weeks. What stands out about this is how small the losses have been. Incredibly, the S&P 500 has now gone 49 consecutive weeks without a weekly loss of 2% or more, the longest since 61 consecutive weeks that ended in early January 1996. The longest ever was 90 consecutive weeks in the late 1950s. This is yet another way of showing how rare the action over the past year has been. What do the stars say? Today is the first total solar eclipse since 1776 whose path falls only in the U.S. In fact, it has been 26 years since the last total solar eclipse was visible in one of the 50 states, which makes today’s event more unique. First things first, we would never invest based on what the solar system is saying. Still, we had many ask – so we looked at how stocks do around an eclipse. For details, please see today’s LPL Research blog. We think it is a good time to consider taking a little risk off table. In our latest Weekly Market Commentary, due out later today, we discuss how the risks to the market have been stacking up, we are in a seasonally weak period, and we’re probably due for a pullback after a long period of calm. But the longer term outlook still looks good, as we see no recession on the horizon and corporate America is in excellent shape. And don’t count out a tax deal in early 2018. If the moon can completely blocked out the view of the sun, as it will this afternoon, then anything can happen.